You won’t settle for just any hinge on your gate when you know can have the best. Turn to the TruClose Regular – Standard and you’ll always look at your fence with peace of mind. 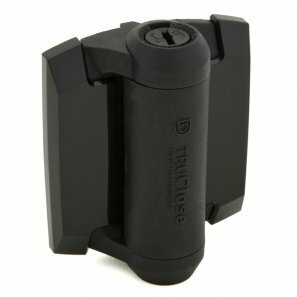 The TruClose Regular – Standard give you self-closing action, along with dual adjustability for gate weight and closing speed. While maintaining its important self-closing safety element the new TruClose Series 3 gate hinges feature improved strength and advanced patented tension adjustment features. The top-selling TruClose gate hinges have been the most reliable self-closing hinges on the market. TruClose Series 3 also offers a unique, custom approach to gate hardware with optional decorative trim covers (black, brushed or chrome), giving customers the opportunity to match locks and lighting fixtures with gate hardware, while hiding fasteners.